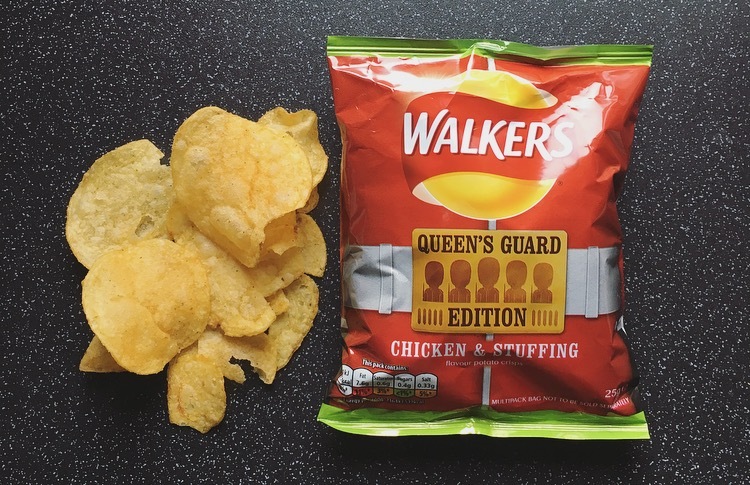 Walkers have launched 2 quintessentially savoury British flavours in honour of the Queen’s 90th Birthday Celebrations and after seeing these I immediately needed them in my life. What are these flavours I hear you cry? 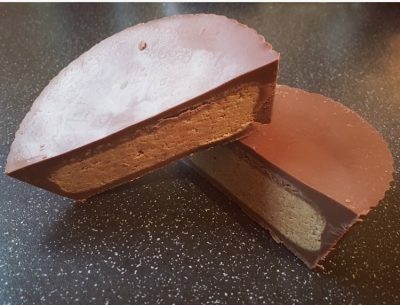 Well they have gone for Walkers Beef & Horseradish and Chicken & Stuffing, and are both strictly limited edition flavours. I have only seen these as a multipack which is 6 25g bags. These are currently £1.83 a pack on Ocado, bit of an odd price if you ask me, and I have also seen them dotted around Sainsbury’s, Tesco and Poundworld. Standard half full 25g bag, they didn’t really smell of all that much and look pretty much like every other classic Walkers crisp. They were delightfully crispy and crunchy, just how a crisp should be, clue is in the word really! Munching away I was immediately hit with a very strong hot horseradish taste, like nose clearing kind of strong. The beef flavour really wasn’t identifiably and any hint of it was smashed down by the horseradish. I actually cannot imagine eating a whole bag of these they were that hot, that being said if you have a cold these might work wonders. Given I am a lover of beef and horseradish these were a slight disappointment with the balance of flavours completely disproportionate with one another. Again these were typical looking except there were some real monster crisps in there. They smelt strongly of roast chicken and the darker orangey coating was clearly visible on each crisp. The crisp crunch factor was evident, there really is no way you can eat these on the sly! The rich roast chicken emulated in the taste, were very flavoursome and had a hint of saltiness which came out more strongly on some of the crisps than others. Stuffing wise well there really wasn’t any. I got the faintest of herb flavour but it certainly wasn’t consistent by any means nor identifiable as stuffing. 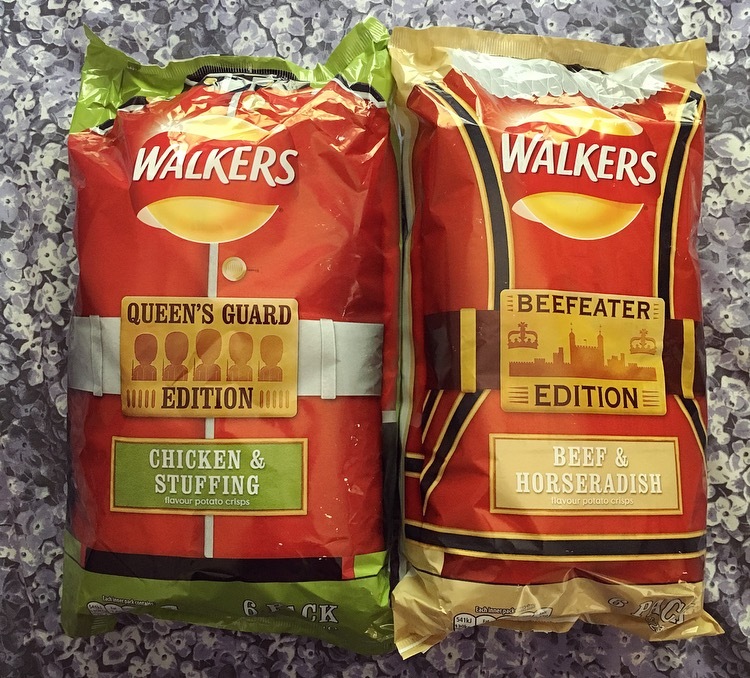 Are the Walkers Beef & Horseradish and Chicken & Stuffing two good flavours to choose for the celebratory packs? I believe so. Could they have been better? Of course. 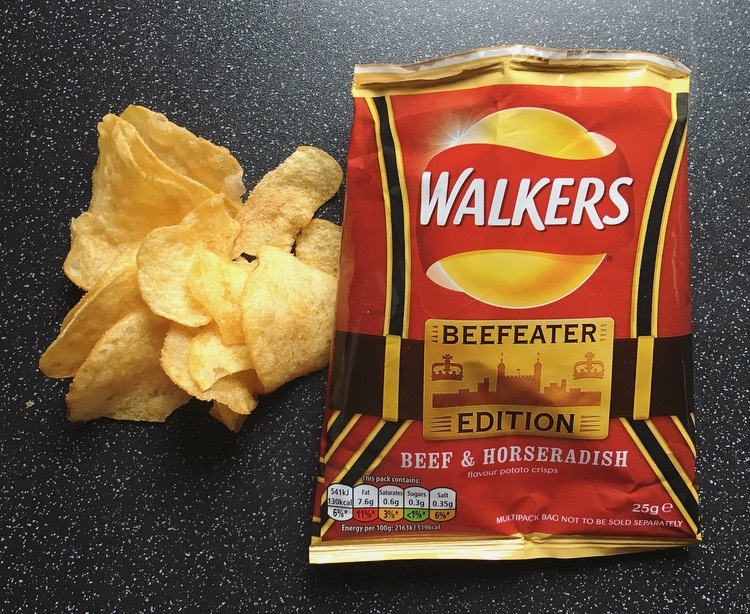 The Walkers Beef & Horseradish is certainly my least favourite of the two, it is far too overpowering and not all that enjoyable. On the other hand I have no problem polishing off the Walkers Chicken & Stuffing crisps given they are finger licking good, but they didn’t give us that prominent stuffing flavour and that really is a drawback. If the packet says stuffing, we want stuffing!